Share your best tomato growing tips or questions with Tomato Dirt readers! What are your best tomato growing tips? Gardeners like you know best. We want to hear from you. 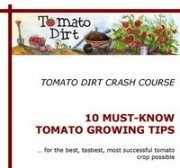 Tell us your favorite tip so we can share your experience with other Tomato Dirt readers. Or share a question you have about growing tomatoes. We’ll publish your approved submission on its own page. Sometimes it’s just one idea that can make all the difference for another gardener. And with tens of thousands of tomato gardeners out there … well, combined that’s a LOT of experience. So when you ask questions or share your experiences, we learn from each other and get new ideas about what to try in our gardens. Do you use any special planting tricks? Where and when do you plant? Do you stake – or not? What kind of crop do you get? What kind of challenges do you face? What have you learned from year to year? We hope you’ll also send a picture if you’ve got one! Just follow the instructions below to send your submission. Thanks for sharing – and happy gardening! How can I grow a sweeter tomato? Will hog wire work to support tomatoes? May I set out my tomato plants if the overnight forecast is cold? Are beans and tomatoes compatible? Should I fertilize my tomato plants?